I have heard about apple butter off and on over the years and never really knew what it was. It seems to be more of an American 'thing'. I wasn’t sure if it was an apple flavoured butter, but when I researched, I discovered it was actually more like an apple jam. A spreadable sweet and spicy concoction perfect for spreading on toast or, in my case, crumpets. I researched it a bit more online and to me the easiest way to make it seems to be in a slow cooker. I found a few separate recipes on-line (including the brown-eyed baker) and tweaked them to suit British measurements. It does take a long while to cook the apples down (oh, and to peel the little buggers first off) but it is so worth it. I jarred mines up and took it along to work. My colleagues loved it. And, they all said it tasted like Christmas. That will be thanks to the spices in it – cinnamon, nutmeg, ginger and cloves. With that in mind, I thought I’d bring you this recipe a couple of months early so you can perhaps give it a try and, if like me, you think it’s fantastic, you could make several jars up as Christmas gifts. As I said, a slow cooker is needed, but the only elbow-grease you need to expend is when peeling the apples. I used gala apples and pink ladies, but any apple would do really. And if it has a red skin, add some of the peel to the slow cooker. This imparts a lovely russet hue to the finished butter. Keep it in the fridge once it’s made. Mine’s has been there for a month now and it still tastes fine. I have also frozen some, as it makes a lot, and when defrosted it was just as good. Peel, core and chop the apples. Place in the bowl of the slow cooker. Add the sugars, spices and salt and stir through. Cook on low for 9 hours. The apples will have reduced and become darker (and smell amazing). Put the lid slightly off the cooker to let some moisture escape and continue to cook on low for another 3 hours. After the three hours, remove from the heat and add the vanilla, stirring through. Use a stick-blender to puree the apple butter. Place in jars and allow to cool fully before placing on lids. It will thicken as it cools. 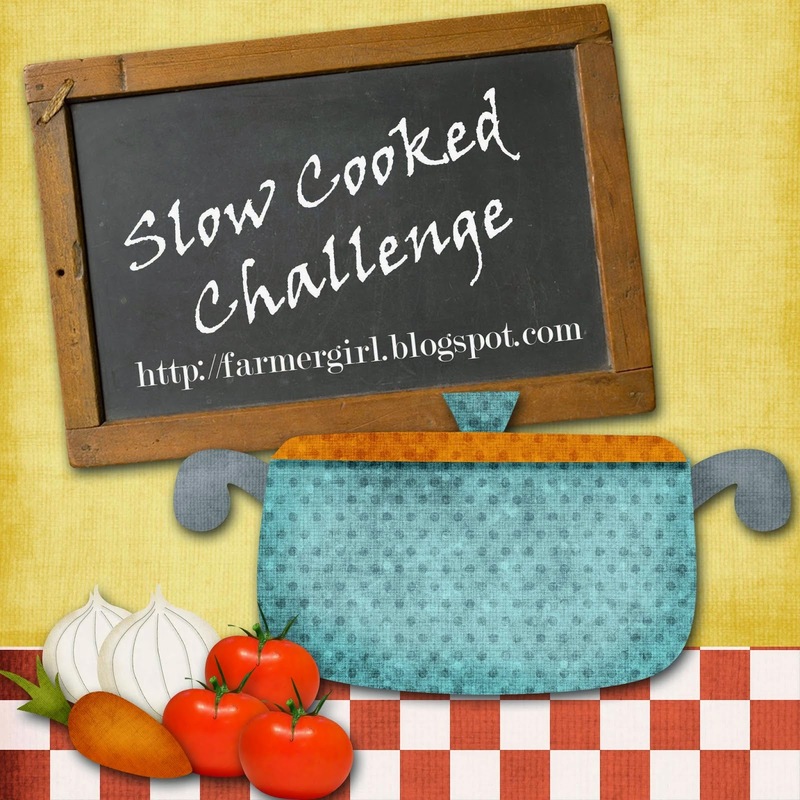 I am entering the apple butter into the 'Slow Cooked Challenge' hosted by Janice at Farmersgirl Kitchen. The theme this month is 'Open', so anything goes. I often hear the tale of how my mum made apple butter years ago when she was trying every apple recipe under the sun to use up a massive crop of apples (given to her or from her garden, I can't remember which) so every time I see it on Pinterest it makes me nostalgic. Yours looks beautiful and I really want some on crumpets for my breakfast tomorrow now! I LOVE this stuff and have JUST got myself a slow cooker so I will be making it over the weekend... I love the colour of yours too. Apparently you can use it in cakes too! Remember to add red peel into the pot for the colour Dom! I've spotted a apple tree nearby, hopefully get to forage and make some again very soon. Well Kate, you don't actually need a slow cooker, but when I made mine I seem to remember I spent 3 hrs stirring constantly and swore I wouldn't do it again! Ah, you're dead right Stuart, you're method looks a lot easier than mine! Lovely colour too. Anything easy in my book Choclette! Thanks for this! I love the thought of it swirled into banana bread.